US mapping expeditions in indigenous lands in Mexico conceal strategic US military economic and geopolitical goals … of particular interest for the United States. In 2006, a team of geographers from the University of Kansas carried out a series of mapping projects of communal lands in southern Mexico’s Northern Sierra Mountains. Coordinated by Peter Herlihy and Geoffrey B. Demarest, a US lieutenant colonel, the objective was to achieve strategic military and geopolitical goals of particular interest for the United States. The objective was to incorporate indigenous territories into the transnational corporate model of private property, either by force or through agreements. Demarest’s essential argument is that peace cannot exist without private property. As the ideologue of these expeditions, Demarest considers collective land ownership to be the birthplace of delinquency and insurgency, and thus believes that collective property must be destroyed. He graduated from the School of the Americas, which is under the administration of the US Army and was founded in 1946 in Panama, with the objective of training Latin American soldiers in war and counterinsurgency tactics. In recent years, graduates from the School of the Americas have participated in assassinations in Colombia, formed part of the drug trafficking organization The Zetas, in Mexico, and were involved in the coup in Honduras in 2009, as was demonstrated by activists through a School of the Americas Watch lawsuit against the Department of Defense in February 2013. “Demarest is one of the coordinators of these expeditions. He was trained in the School of the Americas, later served as military attaché for the United States Embassy in Guatemala in 1988 and 1991, where a counterinsurgency project was implemented that caused terrible massacres of indigenous populations,” says López. According to the May 2014 publication of the Army Manual of the United States (FM-3-24, MCWP-3-33.5), which outlines the strategic ways to break up any type of insurgency, in the section titled “Insurgencies and Counterinsurgencies,” when certain elements within the population grow dissatisfied with the status quo and are willing to fight to change conditions to be in their favor, using both violent and nonviolent means to effect change in the prevailing authority, these are the conditions that lead to insurgencies. In this same sense, this manual was made to counteract any type of insurgency using different methods and in collaboration with what the manual calls “Unified Action Partners,” a collaboration of integrated effort that goes from national companies or multinational ones and government organizations and NGOs, to the presence of intergovernmental organisms such as the United Nations. “Regional organizations like the Organization of American States and the European Union or international organizations like the United Nations may be involved in some counterinsurgency operations. The United Nations, in particular has many subordinate and affiliate agencies active worldwide,” states the manual’s text. “Each year the Minerva Initiative, with Pentagon funding, looks to map 59 indigenous towns in Central America and gives prizes to 12 of the 300 projects that are presented. In 2013, it awarded a project that was going to take place in Honduras with the backing of the National Pedagogical University Francisco Morazán, employing as research assistants people of indigenous and mixed descent to map zones of communal property in order to destroy or annihilate them,” says López. In 2013, the US Department of Defense approved a budget allocation of 1.5 million dollars, with the possibility of increasing it to 3 million, for Jerry Dobson and other researchers to continue with the Bowman Expeditions, now a program with the Minerva research initiative. “The Minerva Initiative is a consortium that moves in relation to the Pentagon’s interests and contacts the best universities in the United States and subsumes Latin America Universities that offer to receive funds from the department of military studies of the Pentagon in order to carry out research for the counterinsurgency,” explains López. There are at least 12 research projects with Pentagon financing under the guidance of the Minverva Initiative to collect data for the counterinsurgency effort. “Another project under the direction of the Minerva Initiative is the megaproject of the University of Washington, in collaboration with Harvard, that looks to study the origin, characteristics and implications of political movements in 23 countries, relying on a database of 58 countries provided by the Minerva Initiative, looking to construct a map of the movements in space and time,” says López. The “reforms” recently approved in Mexico, which include the privatization of education and petroleum resources, as well as drastic changes to Mexico’s financial sector, will have a direct impact on more than 80 million Mexicans, especially considering that 40 percent of spending in the public sector is financed using income from Mexican Petroleum (PEMEX). These reforms create a potential breeding ground for the intensification of new social movements in the country. Although usually pacifist in nature, historically such movements have been labeled as insurgent. In just three federal administrations, almost the same amount of land has been conceded to mining companies as was distributed after the Mexican Revolution in 1910. Over 94 million hectares have been conceded, and a large number of these concessions are located in indigenous territories, where people were not informed of that fact. In December of 2013, Jaime Martínez Veloz, Commissioner for a Dialogue with Indigenous Towns of Mexico, warned that this situation, promoted by the governments of Ernesto Zedillo, Vicente Fox,and Felipe Calderón could provoke social confrontations in the affected regions. The reform to the hydrocarbon law gives a free pass to transnational corporations looking to expropriate territories, through what is referred to in article 33, for public use – and this includes communal lands. Communities have jurisdiction only of up to 30 centimeters beneath the soil: beyond that, it belongs to the federal government. “It opens the door to the expropriation of lands of course for public utility and even to biosphere reserves, as well as to a series of human rights violations,” was one of the positions in the debate over article 33 in the words of Senator Zoé Robledo. During the first 16 months of the presidential term of Enrique Peña Nieto, these reforms have been accompanied by a rise in the criminalization of activism and social struggle in this country. Disappearances and forced detentions are now “unquantifiable.” “From here we say to Peña Nieto that it will not be possible for him to decide for us, because our towns are organized; we have decided that they can kill us, but we are not ceding our land to anyone,” says Felipe Flores, who together with other indigenous communities opposes the construction of a hydroelectric dam called La Parota, in Mexico’s southern state of Guerrero. For López, social struggles are taking place in a context of militarization and counterinsurgency, where one sees the presence of an authoritarian state that uses selective violence, as it did during the dirty war in the 1960s and ’70s, with enforced disappearances, incarceration and persecution. Indigenous communities, where one can find the support bases of the Zapatista National Liberation Army (EZLN) in Chiapas, Mexico, is a living example of the application of the mechanism called irregular warfare, as it is labeled in counterinsurgency manuals. “It is not low-intensity warfare, but a war of comprehensive wearing-down, which goes from the co-opting of communities with government assistance programs, which according to the counterinsurgency is taking the water away from the fish. But it also creates angry fish who are at the service of the state that then attack insurgent fish, or, paramilitary groups from the same community, who are the ones that perpetrated the most recent attack against the Zapatista Movement, a movement that has not undertaken a single offensive action in the last 20 years, because they decided to opt for the road of support for the autonomy of their communities,” says López. 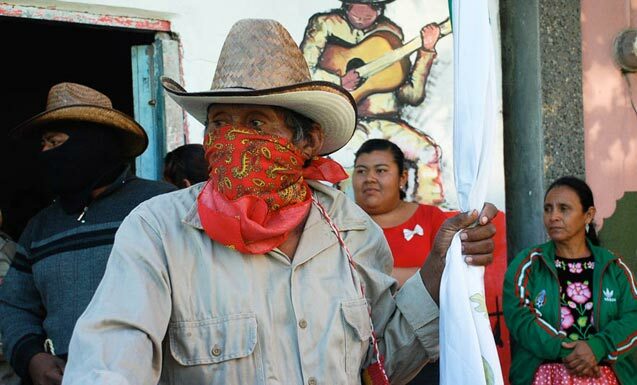 Since the armed uprising of the EZLN in 1994 and since the signing of the 1996 San Andrés Accords regarding indigenous rights and culture, a large majority of the indigenous towns in Mexico have echoed the demands of these accords. Oaxaca, as a majority indigenous state, generated concern for the governor at the time, Diodoro Carrasco Altamirano, and then-president of Mexico, Ernesto Zedillo, who opted to implement a policy of indigenous containment with a series of constitutional reforms elaborated by the Center for Government Studies of Oaxaca. 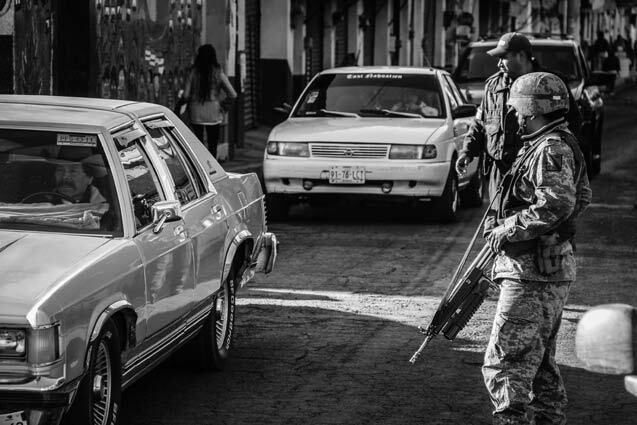 It used the same counterinsurgency tactics implemented by the School of the Americas, which since 1953 and until 1996 had received close to one thousand military police from Mexico to take training courses, principally regarding counterinsurgency techniques, according to one of the chapters of a historical report of the Special Prosecution for Social and Political Movements of the Past (FEMOSPP). That is why in 1996, due to these counterinsurgency tactics, political actions were implemented across the state of Oaxaca to co-opt and buy off social leaders. 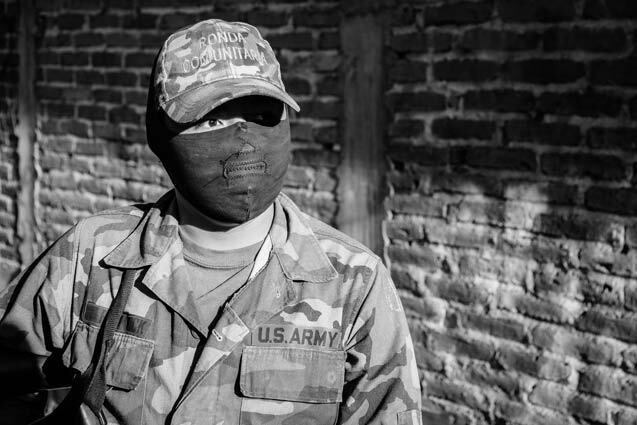 Intelligence and paramilitary groups were created, such as the so-called “Delivery Crew” in the Loxicha region, a group paid by bosses whose most important task is betrayal: They turned in presumed guerrilla fighters and tortured, selectively assassinated, raped women and made arbitrary detentions. 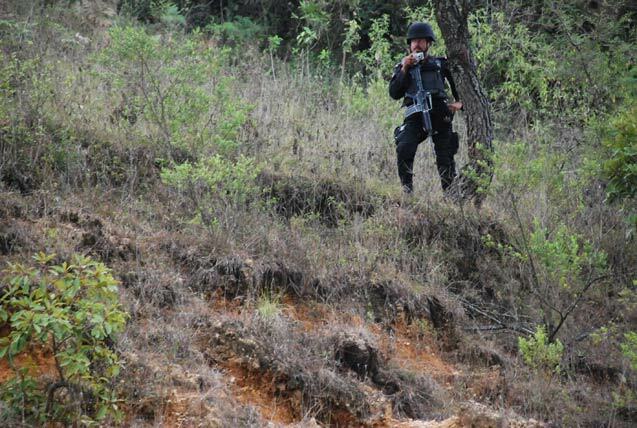 Of the over 150 indigenous individuals detained during that time, in the year 2012, there were still seven prisoners, known as the Loxicha prisoners. In 2006, during the term of Ulises Ruis Ortiz, over 2 million people spilled into the streets to ask for the removal of the governor. Since then, counterinsurgency tactics have been constantly reworked in this region of the country. 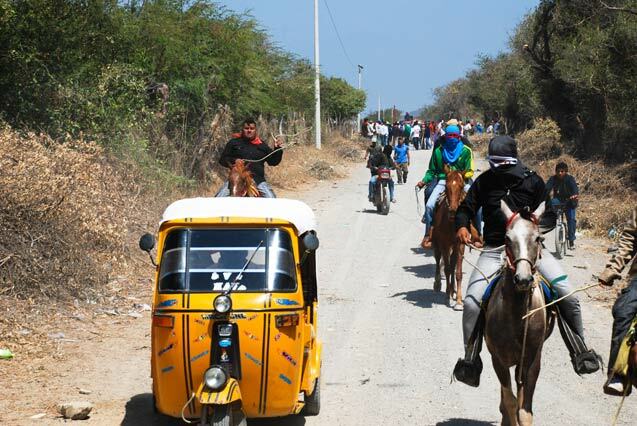 Since this period, the city of Oaxaca is one of the most monitored cities in the world, with C4 intelligence technology, with more than 230 cameras that form part of a Command, Control, Computers, Communications Center (C4), that, among other activities, does not just film and capture information in each of the monitored areas, but is also capable of facial recognition, and of recognizing gestures and physical features, supported by deaf-mute individuals that analyze every movement caught on film. In a war, battlegrounds are defined and an enemy is identified that must be reduced or controlled. In this case, it appears that indigenous towns have been identified by governments and corporations as a potential enemy – which in turn threatens the conservation of communal territories and autonomous self-governance. Meanwhile, in stark contrast to the bellicose and destructive power of governments and corporations, in indigenous towns’ struggles, resistance and community cohesion are the principle weapons.